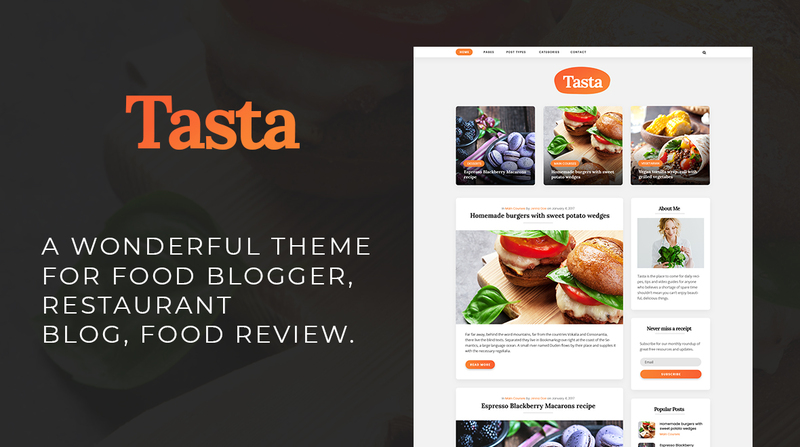 Tasta is a Food Blog WordPress theme for food Bloggers. It has many useful features to allow you to build a creative food, travel, or lifestyle blog in a few minutes! Tasta was designed by our talents and passion. We took great care with details, to make it look perfect. Focuses on delivering content to visitors. Designed to increase Conversion Rate. Built based on our own new framework which is fast , easy to update and easy to develop! Demo.xml file included, setting up live demo in just a few minutes. Customer satisfaction is our top priority, don’t hesitate to contact us using the contact form on our profile page if you require any assistance. We'll try to reply within 24 hours.